The communication process; What you should know before writing a paper; The writing process: Technical considerations; Writing a journal article; Writing a book, a report or a chapter therein; Writing conference papers and issuing proceedings; Using illustrations; Citing the work of others: How and why; Editorial revision; Producing leaflets; How to organize a conference; How to produce effective presentations; How to produce effective posters; Addressing the media. A librarian’s main task is to acquire, organize, process, retrieve and disseminate information to all possible users, but also to communicate and develop professional skills in this field. 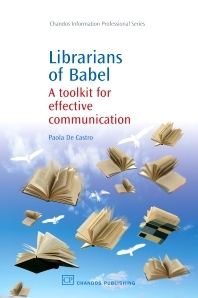 This collection offers an introduction to the different challenges that librarians and information specialists are called upon to carry out in order to achieve effective communication through different media. The main elements of professional writing, conference or workshop organization power point presentations are outlined. Paola De Castro is the head of the Publishing unit of the Istituto Superiore di Sanità (Italian National Institute of Health) and a member the editorial committees of the publications edited by the Institute itself and others. She takes part in development of the Institute’s digital archive of publications in public health and promotes the new model of Open Access publishing. She has written many articles on information transfer process, research evaluation and scientific communication; delivers courses on scientific writing, organises conferences and exhibitions both for the general public and specialized public health operators. She is involved in a number of activities for the promotion of science culture in schools and carries on projects regarding the preservation of historical heritage belonging to scientific institutions.